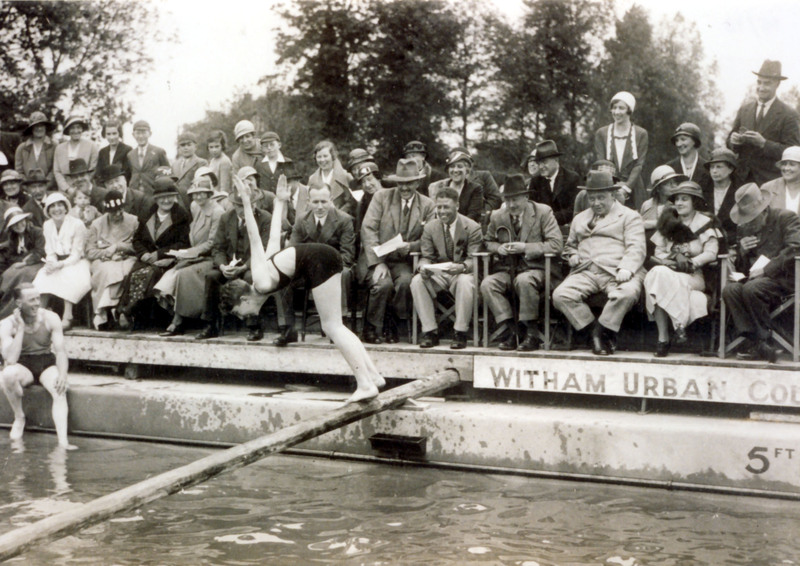 The opening of the Witham Urban District Council’s outdoor swimming pool behind the Swan, May 1933. Sitting on the front row to the right of the diver, left to right, are: W. W. Burrows, (large hat), Esmond Smith (no hat, dark-skinned), Gerald Bright (hands together), Sir Valentine Crittall (white suit; he performed the opening ceremony). Standing at the back to the right are Miss Hardcastle (tall, white hat), Mrs Hardcastle (the next to the right). A gala and an exhibition water polo match followed, provided by clubs from Maldon and Braintree. Thereafter, Tuesday evenings were to be reserved for the Witham Ladies’ Swimming Club. The pool closed in 1936 because of poor water quality, but after protest meetings it re-opened again until 1939. See the Braintree and Witham Times for 1st June 1933.